The Music Trust has announced a list of nominees for the 2015 Freedman Classical Fellowship. The annual Freedman Classical Fellowship, held by The Music Trust is designed to assist young top Australian classical musicians aged up to 30 years to build further career success. Based on an invite-only process, nominees are selected by senior industry figures in each state. Those nominated compile a project proposal and a recording, and from these, four finalists are selected to audition for the judging panel. Jacob is an adventurous and fearless pianist with a particular commitment to new music, and has been building a steadily increasing reputation particularly among young composers as a go-to collaborator. His particular love of the music of Messiaen has seen him tackle such major challenges as the solo piano parts in Oiseaux exotiques and Des canyons aux étoiles with great success. He is also the only Australian exponent of the Ondes martenot; he first tackled it for a performance of the Turangalila-Symphonie in 2011, and is presently embarking on a project to generate new Australian repertoire for the instrument. Sami has won competitions locally and nationally. He recently had a very short trip to USA for study and has been a regular percussionist with AYO. He is a fantastic talent and motivated, I’m sure he has a great career ahead. Alicia Crossley is not only a highly talented performer, but has demonstrated capacity to produce extraordinary projects that explore new directions whilst fulfilling her commitment to the needs of the Australian new music landscape. She has nurtured relationships with a plethora of composers, whilst ambitiously developing her own performance career without waiting for any big breaks. A self-starting self-made professional, Alicia is about to release her second solo album, present a mass-schools recorder event, tour Australia’s east coast with a harpist she met whilst touring America last year, and has accolades and multiple reviews that reference her outstanding achievements. Aviva is a clarinettist and composer forging an innovative and varied career across the fields of contemporary classical music, world music and improvisation. A master of bass and contrabass as well as the smaller clarinets, she has performed many of the landmark 20th-century virtuoso works for her instruments. She is also particularly interested in redefining the concert experience, collaborating with theatre and lighting designers to devise site-specific performances. Jessica is a wonderful, responsive musician of the highest order. I had the great pleasure of working with her on the ANAM production of Reinbert de Leeuw’s Wunderschön with Meow Meow, and was immediately impressed not only by her flawless technique, but also her deft sense of theatricality. As a creature of the theatre myself, it was a joy to watch her effortlessly transform and play music replete with character and understanding – responsive to every aspect of the theatre. It’s a rare gift. Jessica is an extremely versatile and distinctive musician, performing comfortably in many different styles of music. She has collaborated on projects with actors, visual artists, dancers, sound designers and ‘world’ and chamber music groups. Since finishing her masters in early 2013 Rebecca has collaborated with lots of different performing groups and projects in Sydney, including Sydney Symphony. She has a strong interest in orchestral leadership and is able to expand her professional experience by leading various projects including leading the Sydney Camerata in concert with the Sydney Chamber Choir in 2015. In 2013 Rebecca led a fellowship ensemble in a performance of Schubert’s Octet as part of Kathy Selby’s lunchtime series at Angel Place; in 2014 she worked on a solo concerto project as an artist in residence at the Banff Centre; in 2015 she will perform as a chamber musician in a historical performance ensemble for The Raven, a concert combining music and poetry. Callum is a sublime musician. On his chosen instrument, the trumpet, he speaks the languages of many musical genres – heritage classicism, jazz and the contemporary avant-garde. His wide ranging interests make for brave and inspired musical choices. I have had the great pleasure of utilizing him in my last two projects – The Riders for Victorian Opera and Kate Miller-Heidke’s The Rabbits. During The Riders, he shared the pit with the likes of Genevieve Lacey and Joe Chindamo, and was absolutely their equal in technique and musical responsiveness. In 2014 Jessica graduated with first class honours from The Australian National University School of Music, having studied with Timothy Kain and Minh le Hoang. Her undergraduate years saw the award of many scholarships and prizes including second prize in the prestigious Adelaide International Guitar Competition in 2012. In November of 2014 she was awarded first prize and the title of Young Virtuoso of the Year in the Fine Music Network National Competition. Suyeon Kang is an Australian violinist living in Berlin, working across Europe. She’s currently a student at the Hochschule für Musik Berlin, studying with Antje Weithaas. She’s had multiple competition wins and prizes nationally and internationally, her first major success in the ABC Young Performer Award, which she won in 2005 at the age of 16. In the intervening years, she’s undertaken rigorous study, and built up a substantial freelance career in Europe as chamber musician, soloist, and guest assistant concertmaster with various orchestras. She’s a stellar player, working with some of the great classical music institutions in Europe, and is increasingly gaining recognition as a serious chamber musician. Catherina Lee is one of the most gifted and promising violinists to have emerged from Queensland in recent decades. In my view she stands in the class of former Queensland-based musicians that showed great promise at an early age such as Dene Olding (SSO Concertmaster and Goldner Quartet) or more recently, Ray Chen (internationally acclaimed concert violinist), yet she has her own rare musicianship that has a poignancy and sensitivity that is unique and very much her own. While still in high school, Catherina was one of only 5 students out of over 100 applicants to be accepted into the studio of no less than Professor Gerhard Schulz at the National University of Vienna. Mary Osborn is a Classical Saxophonist based in Sydney, and studied at the Sydney Conservatorium of Music with Christina Leonard on a full scholarship. In 2015 she premiered a saxophone concerto, Oil, Steam and Steel by Australian and American composer Adelaide Coles. In 2013 she achieved first place in the Sydney Eisteddfod Saxophone under 25 competition, in 2014 achieved 3rd place in the Singapore Woodwind Festival saxophone competition, and was a semi-finalist in the Gisborne International Music Competition. In 2014 Mary arranged and performed Jacob Ter Veldhuis’ Tallahatchie Concerto, the arrangement for alto saxophone, string quintet and piano will soon be published by the composer. Mary is the soprano saxophonist and co-organiser of the Petrichor Saxophone Quartet. In 2014 they achieved first place in the Sydney Eisteddfod Musica Viva Chamber Music Award and have since performed for Musica Viva at St. James Church, and on Fine Music 102.5. Petrichor Sax has premiered over 15 new Australian works since forming in 2012. In 2014 they collaborated with a trombone quartet, including two new Australian works for the octet, and soprano sax, trombone and piano trio. Petrichor Sax is planning several concerts throughout the year, each featuring new Australian compositions. Benjamin is a brilliant young saxophonist, well known to me through his studies at UTAS, via internal activities and public performances. He is already establishing fine international links, and is clearly a young player determined to map an outstanding solo career, both within Australia, and overseas. His playing is always spectacular, both technically, and interpretatively. Ben has particular interest in new works, having commissioned many, and has already established an outstanding contact list of composers and collaborators around the world. He is a player who has fulfilled brilliant early potential, now well on the way to an established international career. His high intelligence will see him chart the coming years impressively, and I’m certain he will be an Australian star of considerable impact in the very near future. Alex Raineri is already appearing as a highly regarded soloist on Australian stages, and has performed frequently on international stages. He has been the recipient of innumerable awards and prizes both as concert soloist and chamber musician (as his website will attest). Most notably, at such a young age he has already been part of establishing and being co-artistic Director of a highly successful contemporary music ensemble in Brisbane called Kupka’s Piano. With Kupka’s he has undertaken many Australian premieres. Alex has also been a guest artist of choice by Universal Australia. Nick is very talented and self-starting. He is highly capable as a creative performer and he’s also fantastic to work with as he is genuine, kind and doesn’t take anything for granted. His attitude and talent has led to him performing across a spectrum of genres with numerous ensembles including Acacia Quartet, Continuum Sax, Duo Histoire, Sydney Camerata, and Nexus. He was a recipient of the Kruger Scholarship by Fine Music FM and has recently benefited from a Bundanon Trust Artist Residency. Matthias Schack-Arnott is a Melbourne-based percussionist working as a performer, composer and improviser. Mattias has been the Artistic Associate of Speak Percussion since he was 21, and he’s become a key person in the creative team and a performer in most of Speak’s projects nationally & internationally. This association has given him a broad range of experience, not just as a performer, but also as a producer, creator, and collaborator. Alongside his work with Speak, Matthias is the founding member & co-director of two other new music ensembles in Melbourne, Quiver Ensemble (2009-2014) and CATHEXIS (2013-), so he’s a musician of ideas and action. His solo work shows Matthias to be not only a highly skilled percussionist, but also a genuinely interesting conceptual thinker, with beautiful sensitivity to sonority and space. Andrew Batt-Rawden is a composer with a background in directing and producing contemporary-classical/art-music. Jane Edwards, is coordinator of classical voice at Tasmania Conservatorium of Music. A soprano, she has performed for every major festival and symphony orchestra throughout Australia and was a long time member of the Song Company. Iain Grandage is a music director, cellist and composer of scores for theatre, dance and the concert hall. 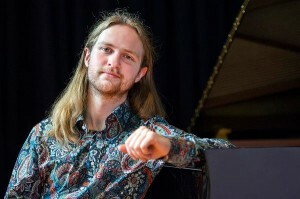 Elliott Gyger is Senior Lecturer in Composition at the University of Melbourne. Genevieve Lacey is a recorder virtuoso, serial collaborator and artistic director. Passionate about contemporary music, she creates possibilities and contexts for new music, people and ideas. Janis Laurs has been on the permanent staff of the Elder Conservatorium of Music since 1985 and is also currently the Principal Cellist of the Adelaide Symphony Orchestra. Paul Stanhope is recognised as a leading composer in Australia. He has also had prominent performances of his works in the UK, Europe, Japan and the United States and is currently a Senior Lecturer in Composition at Sydney Conservatorium of Music.